The McMillan name is virtually synonymous with options. Over the years, this legendary trader's popular and informative books, newsletters, and seminars have helped both new and seasoned investors use options to consistently enhance their trading profits. 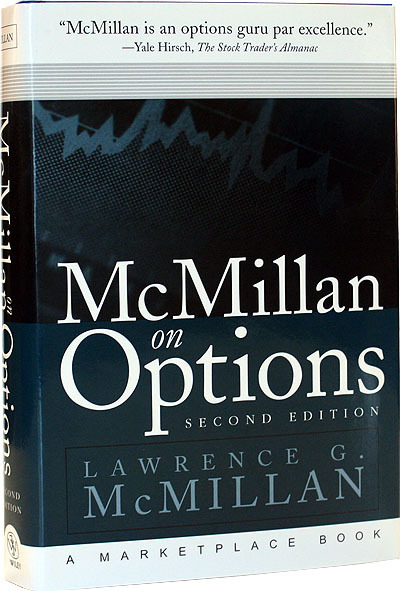 McMillan first shared his personal options philosophies and techniques in the original McMillan on Options. Now, in his revised and expanded Second Edition, he reveals a number of new approaches for success in today's fast-paced and ever-changing investment arena. By exploring both the flexibility and predictive ability of options, this highly revised resource will show you the best new ways to apply options to everyday trading situations. You'll quickly learn how to establish self-contained strategies, substitute options for other financial instruments and protect your positions -- whether in stock, index, or future options. More importantly though, you'll receive a complete education in the exciting new products that are popular with investors, from single-stock futures and exchange-traded funds to LEAPS and volatility futures. This timely Second Edition also expands on discussions regarding the NYSE as a faulty indicator, the history of market volatility, and the importance of buying and selling volatility. Readers can now gain a unique insight into McMillan's personal philosophy on options, and discover the innovative new tactics and strategies he applies to his own trading and analysis. Packed with hands on examples and techniques that address hedging and volatility -- plus fresh new pricing concepts -- this comprehensive and updated work will help you understand and unleash the full power of options. "When it comes to options trading education, no one is more respected than Larry McMillan. With all the new innovations in the options arena over the past decade, this revised edition of his classic work is a must-have for ardent options traders and novices alike"
"Larry McMillan has proved once again that he is an option strategist and educator without peer. In this book, he provides an intimate look at his own personal trading philosophies. He has tryly raised the bar in his update to McMillan on Options." "Amazingly, Larry McMillan has outdone himself. His update of McMillan on Options not only expands the original research to include single-stock futures, LEAPS, ETF's, and volatility futures but goes beyond theory and reveals his personal strategies and new methods. McMillan's put-call ratio work is bar none. An absolute must-read for traders of all levels!"